This is yet another great Julie Goodwin recipe. She makes food that looks so impressive, but it is not difficult to make. That is why I love her food. I made this on Christmas morning with complete faith it will work, as I have yet to try a recipe of hers that doesn't. And her Pavlovas are the ones I love best. This is basically a Pavlova in a tree form. It looks so impressive when assembled. 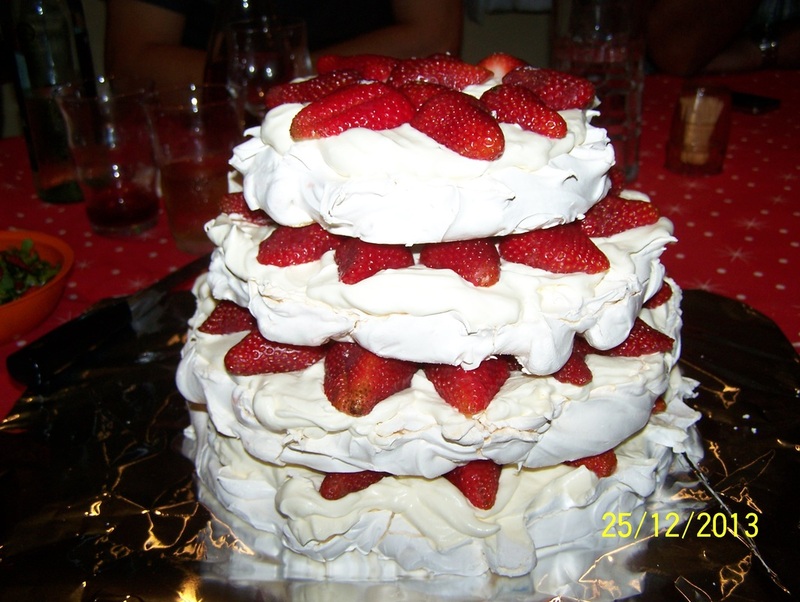 It is great for Christmas, as after eating all day, a light dessert like a Pavlova is all that is needed. 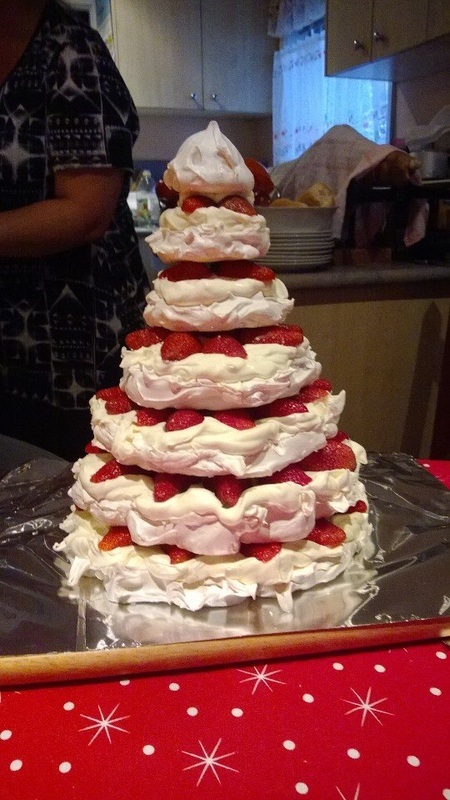 You can make the meringues in the morning, but only assemble the tree just before serving. Make sure the meringues are dry and crisp when baked. If you have a large oven and mixer, you may be able to bake the meringues in one batch, I can't, so I do it in two batches. This would look amazing at the centre of your Christmas table. I was at my mum's that day and forgot my plate to serve it on, but it would look brilliant on a cake stand. It gives the illusion that the tree has a trunk. Preheat the oven to 120C/100C fan forced. Line two oven trays with baking paper, lightly grease the paper. Draw 6 circles on separate sheets of baking paper. Draw a 25cm, 22cm, 20cm, 16cm, 13cm and 9cm circle. Cut out the circles. Arrange the 22cm, 20cm and 13cm circles on the prepared trays, allow about 4cm space between each circle as the meringues will spread while baking. Lightly grease the circles, dust with sifted cornflour. In a large bowl of an electric mixer place 6 egg whites and a pinch of salt. Beat on high speed until you have soft peaks. Slowly start adding 330g caster sugar-a tablespoon at a time, until it has all been added. Scrape the sides of the bowl now, then continue beating until your egg mixture has stiff glossy peaks. You will beat it for approximately 10 minutes. Fold in 1/2 tablespoon of vanilla extract. Spread the meringue evenly between the 3 prepared circles, leaving a 1cm border inside the edges. Each meringue should be about 2cm thick. Using a palette knife or back of a spoon, make peaks on the edge of each meringue. Bake meringues for about 1 3/4 hours or until dry to the touch and crisp. Rotate trays halfway through baking. Cool meringues in the oven with the door ajar for 30 minutes. Carefully transfer meringues on baking paper to wire racks to cool completely. Arrange the 25cm, 16cm and 9cm circles on the prepared trays, allow about 4cm space between each circle as the meringues will spread while baking. Lightly grease the circles, dust with sifted cornflour. Place 1 cup meringue into a piping bag fitted with a large plain tube. Pipe a 6cm peaked meringue for the Christmas tree top on one of the baking trays. Use the back of a teaspoon to form peaks. Bake meringues for about 1hr 45min or until dry to the touch and crisp. Rotate trays halfway through baking. Cool meringues in the oven with the door ajar for 30 minutes. Carefully transfer meringues on baking paper to wire racks to cool completely. Beat the cream in a large bowl with an electric mixer until form peaks form. To assemble just before serving, remove baking paper from all the meringues. Place the 25cm meringue on a cake stand. Spread with some of the whipped cream. Arrange the strawberries around the edge of the meringue with the points facing out. Arrange 6 strawberry halves in the centre of the meringue for support. Carefully place the 22cm meringue on top, spread with some whipped cream. Arrange strawberries around the edge of the meringue with points facing out. Arrange a few strawberries in the centre. 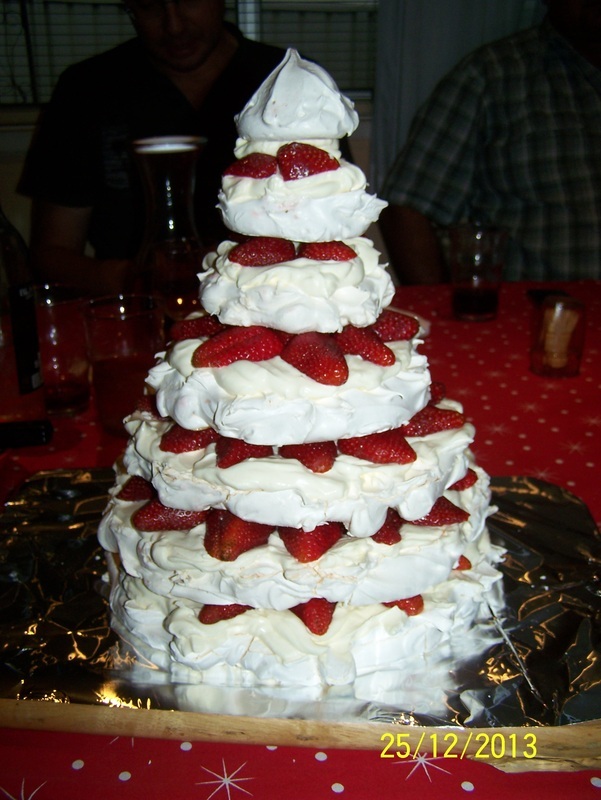 Repeat with remaining 20cm, 16cm, 13cm and 9cm meringues, cream and strawberries. Position the piped peaked meringue. Dust with sifted icing sugar. When you are going to eat it, the top two layers go to one person, then just take off each meringue layer and slice and serve.